High Life Highland is a charity registered in Scotland, formed on the 1st October 2011 by The Highland Council. HLH develops and promotes opportunities in culture, learning, sport, leisure, health and wellbeing across nine services throughout the whole of the Highlands, for both residents and visitors. 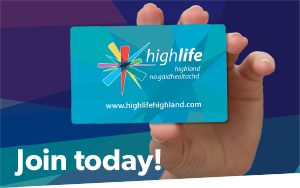 For information on everything from the hugely popular High Life leisure card (which offers affordable access to dozens of leisure facilities), to how to get the best out of our Highland Libraries, what happens at the Highland Archive & Registration Centre or a host of other aspects of cultural, sporting, leisure and learning life in Highland, just follow the links on this site. If you are not yet a High Life member, why not complete our joining forms and drop them into your nearest High Life Highland venue and start enjoying the benefits? Click here to hear the winning story from Our Dinosaur Story Competition - congratulations to all the category winners and thank you for all your entries!